Stormwater best management practices (BMPs) is a term used to describe a type of behavior, measure or structural control to prevent polluted stormwater runoff. Stormwater BMPs aim at managing the quantity and improving quality of stormwater runoff while taking into account flood and erosion control, human health, fiduciary responsibility and feasibility. There are many different BMP options, so it is important to understand the different types of BMPs and chose the most appropriate combination of BMPs for your environment. Below is a list of some stormwater BMPs that are well suited for addressing stormwater pollution in Hawai'i. Rain gardens, rain barrels and pervious pavement are three ways you can help capture stormwater on your property, intercepting the stormwater to natural processes rather than becoming polluted runoff. A rain garden is a deliberately build depression planted with native vegetation that directs storm water from impervious surfaces, such as roofs, roads or parking lots, to collect, briefly settle, and then infiltrate into the ground. 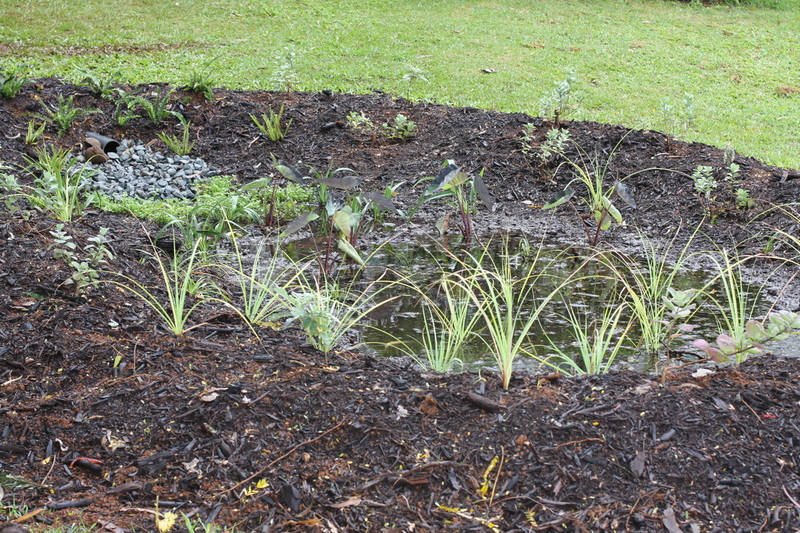 Rain gardens intercept storm water before it becomes polluted runoff and uses the storm water as a resource for watering the rain garden and recharging the aquifer. A rain barrel collects rain water and stores it for later use. Rain barrels prevent storm water runoff, lower water bills, and provide an available source of water for watering the garden, car washing, etc. 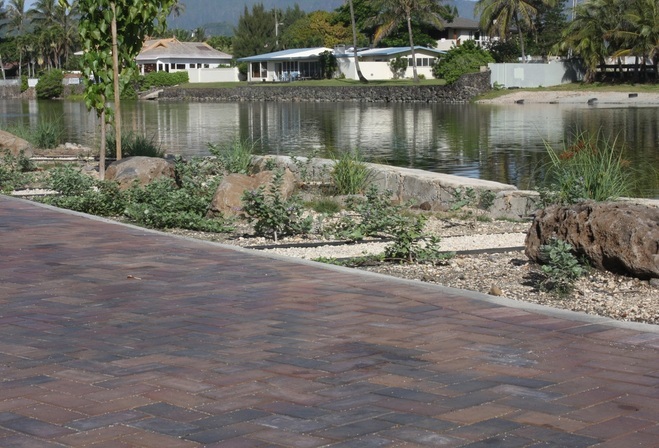 Permeable pavement allows water to penetrate into the ground underneath the pavement and reduces the amount of pollutants and debris that would otherwise be washed off hard surfaces into streams and rivers. Permeable pavement helps to reduce runoff, trap and filter sediment and pollutants, and achieve beautiful atheistic improvements in an area. Share your projects and inspire others to adopt stormwater best management practices too!